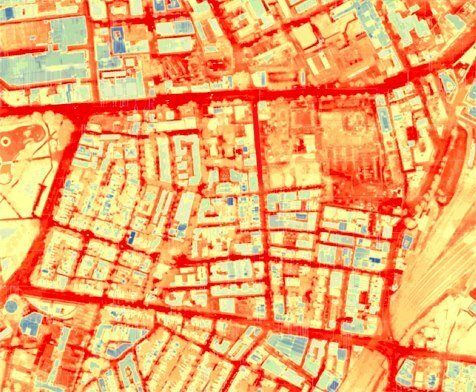 Researchers predict that summer temperatures in Melbourne could peak at over 48ºC (119ºF) by 2020, causing a wave of heat-related deaths, especially where people have to be outside, like waiting for public transport. How can smart urban design save the day? Planting more trees and creating urban forests is a long-term answer but trees take time to grow. This is where urban design comes in, as built infrastructure can be completed in only months. Using data collected over an area of Moorabbin Junction in Melbourne and some sophisticated computer modelling, researchers from the University of Melbourne found that creating small microclimates through the area could reduce the apparent temperature by about 12 degrees C.
There are some very clever solutions here, using berms and buildings to direct air flow, evaporative cooling, having a combination of day time shade but night time exposure, and geothermal cooling. A must to watch for all landscape designers and architects, as mitigating urban heat island effect is an essential part of all design, both residential and commercial.